You have savings. I need capital to get things rolling. I interest you in allowing me to use your savings by offering to pay you a little more than I borrow when I repay you. This also rewards you for taking a chance on me. The difference between what I borrow and what I repay with time factored in is the interest rate. If I loan out my money at 1% over 70 years it will double. If I loan out money at 70% for one year it will double. If I continue loaning out the principal and any interest earned I earn more. And more. And more. It’s compound interest. Bill Bonner covers this in Family Fortunes: How to Build Family Wealth and Hold on to it for 100 Years. He says old money sits. Old family money moves slowly. It doesn’t get consumed. It is guarded and at the right times is nurtured into growth. Is this interesting? Well, yes but no. But it happens all the time on the farm. My wife’s aunt and uncle are tireless supporters of our efforts on the farm. They are also an example to us of what could be. Each year they host events at their house selling splits and starts from their garden. This year they surprised us with coneflowers, red bud trees an, most recently, daylillies. I think daylillies are a good example of compound interest. Unlike rabbits, they don’t taste very good [Turns out I’m wrong. See comments]. Their value is in their continued existence. But their continued existence and health multiplies them. So you split the cluster and plant them again. And again. And again. Before long you have so many daylillies you are looking for a niece to give them to. 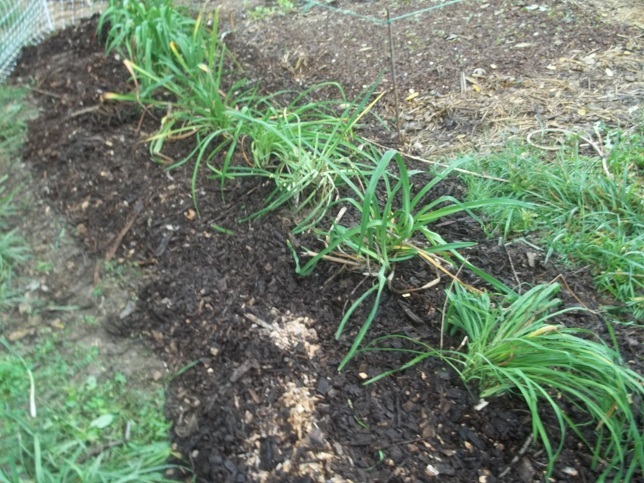 Like old family money, old family daylillies are guarded, nurtured and grown over time. Time. How do we make daylillies? The old-fashioned way. We grow them. I know this is a farm blog but what’s the fun of gardening if you don’t have something pretty to look at too? My kids like flowers. I like flowers. My wife likes flowers. And our interest is compounding. Who knows? Maybe we’ll start propagating plants too. Gotta do something interesting with all our free time. This entry was posted in Gardening and tagged Daylillies, Daylilly. Bookmark the permalink. I looked at the garden picture and thought “that looks like my yard…” Surprise! I’m glad you have the daylilies planted so quickly. The rain we’ve been having will make them very happy. Daylilies are amazing plants. Hardy and, once established, need little or no care. They happily wait until you decide you’d like to divide them for more plants. They are drought tolerant, too, once established. Another good point. I do have to correct one thing. Daylilies are edible and taste delicious! The new growth in spring is tender and asparagus like. The flower buds can be sauteed in butter. They can be pickled. And the opened flowers taste like sweet tender lettuce and are a colorful addition to any salad. We have 400 cultivars and I haven’t tasted a bad one yet. Of course, the opened flowers can be stuffed with any kind of stir fry or a cold chicken salad. Daylilies probably pair well as a side to rabbit. 🙂 We haven’t tried the tubers yet, but this article says they are very good. Even the comments on that post are worth reading. And daylilies sell well if customers see them when they are blooming. Maybe you’ll have a daylily farm (or field) one day. 🙂 With 3 or 4 plant sales (maybe four hours each) we easily raise $800-$1200 each summer for the mission fund at church. Most of the sales are daylilies. We sell two fans (not a whole clump) for $5 – $20, depending on what we paid for the original start. A project any child trained to properly dig and divide plants could manage. LOL Well, so much for that. The example still works if you even if you spend a little out of your savings…er…growings. Bees fly up to 2 miles so the best I can hope for is to give them reasons to be in my garden. Cover crops like buckwheat may get the job done. Average yield off of three hives? We’re just hoping to bring these bees through winter. I love the dewy cobweb photo across the top of your page. Thanks. That was our back yard in July of 2011…just before the drought took hold. consider the lilies of the field, they toil not…. Sorry, it was just begging to be said :). Long ago the Thomases planted roses and daffodils down both sides of my driveway – throughout spring and summer it is a delightful tunnel of greenery and blossom that never fails to lift my spirits. They had a small dairy herd and ran this place as a mixed farm as well as running a butcher shop on the side. They were busy and short of money, but found time to create this beauty anyway. They made a deposit and I’m gaining from the interest, but I hope they did too in their time here.